pursue bachelors, masters and doctoral programs at universities and colleges in Norway. countries in the Western Balkans, Eastern Europe and in Central Asia with financial support to study for a degree in Norway under the Quota Scheme. As a student, you must apply directly from your home country. You must have stayed at least one year in your home country directly prior to the planned course of study at the Norwegian university /university college. Students usually apply for degree programmes that serve as a continuation of their studies in their home country or for courses which can be a joint part of a degree programme in their home country (joint degree or sandwich programmes). Most of the programmes offered are at Master’s or PhD level, but the Quota Scheme also offers certain Bachelor’s study programmes. Language Requirements: Most of the study programmes offered under the Quota Scheme are taught in English. Applicants who are not native English speakers therefore must document their proficiency in English. Some exceptions apply for certain professional educational courses at Bachelor’s level. 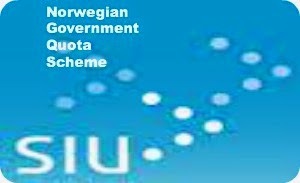 The Quota Scheme will only enrol students from institutions (organisations, universities, authorities) which have collaboration agreements with Norwegian universities or university colleges. Norwegian institutions usually do not admit free movers (individual applicants) to this scheme. Only in very special cases will free movers be considered. Students who come to Norway as self-financing students will, as a rule, not be considered as being qualified for the Quota Scheme. Each successful applicant will receive the same amount of money as a Norwegian student would do in an equivalent educational programme. Up to 40 per cent of the amount is given as a grant and 60 per cent as a loan. However, the loan portion may be waived when the student returns to his/her home country after completing the course of study. Students who stay in Norway after finishing their studies or take up residence in another country than their home country must repay the loan.